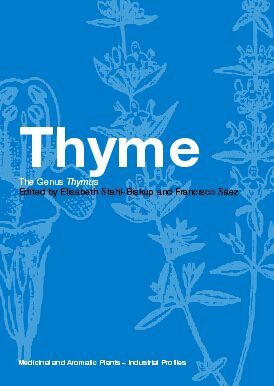 The genus Thymus consists of about 350 species of perennial, aromatic herbs and subshrubs native to Europe and North Africa. Various types of thyme are used all over the globe as condiments, ornamentals and sources of essential oil. Thyme oil (distilled from its leaves) is among the world's top ten essential oils, displaying antibacterial, antimycotic, antioxidative, food preservative and mammalian age-delaying properties. Because of the wide variety of its applications, the demand for thyme oil is growing; hence thyme commands an important place in an expanding world market. Commercial supply of thyme originates mainly from European countries, but recently this increased demand has lead to new winter-hardy, high yield cultivars being developed for commercial cultivation in Canada and North America. This comprehensive volume covers all aspects of the biology, cultivation, pharmacology, chemistry and industrial processing of the genus Thymus. It is the most up to date overview of current knowledge in thyme use, and will be an invaluable reference source to those interested in medicinal plants, natural products, pharmacy, pharmacognosy and agronomy. "An impressive amount of technical information is presented… . The quality of information found herein is equally impressive. … The articles flow well; keeping your interest throughout and the text is well illustrated with tables, charts, and diagrams, some in color. Thoroughly researched, the biological coverage is broad … . … This volume is a worthwhile investment. It is highly recommended for health and academic libraries. Professionals in the fields of alternative medicine, herbs, and pharmacology may want to add this text to their personal collection." The History, Botany, and Taxonomy of the Genus Thymus. Population Structure and the Spatial Dynamics of Genetic Polymorphism in Thyme. Essential Oil Chemistry of the Genus Thymus - A Global View. Essential Oil Polymorphism in the Genus Thymus. Flavonoids and Further Polyphenols in the Genus Thymus. Field Culture, In Vitro Culture and Selections of Thymus. Harvesting and Post-harvest Handling in the Genus Thymus. Thyme - Processing of Raw Plant Material. The Genus Thymus as a Source of Commercial Products. The Medicinal and Non-medicinal Uses of Thyme. Thyme as a Herbal Drug - Pharmacopoeias and Other Product Characteristics.